I didn’t eat breakfast today, so here’s a picture of yesterday’s disappointing brunch at Le Petit Bakery and Café in Ventura County. The nice thing about the restaurant was that the outside patio overlooked the Ventura Harbor--oh, and the pastries seemed good. 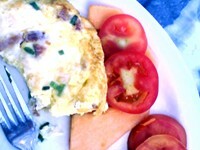 My proscuitto, green onion and Swiss cheese omelet that looked like a frittata was OK. I didn’t complain about the fact that ham was substituted for the proscuitto or that my paid for side of tomatoes weren’t ripe. DK had already gotten attitude from the waiter for sending back his goat cheese, sundried tomato and basil scramble for lacking any ingredients in it besides eggs. The amazing thing was that when I asked the waiter if the French chef who had opened the restaurant was still there, he said yes and that he still does all the cooking. 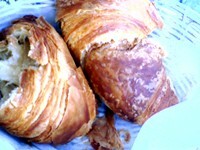 Even the fresh croissants that were literally the size of a small football were only mediocre.